†Supported in this research by the National Science Foundation Undergraduate Research Participation Program. Measurements and calculations using elliptically polarized light to determine the thickness and index of refraction of barium stearate films on a variety of substrates are described. Attention is focused especially upon problems associated with the study of very thin films, that is, films which are less than 100 Å thick. Measurements of the optical constants of metal substrates are presented. An apparent dependence of the index of refraction n and extinction coefficient κ and independence of the absorption coefficient k upon the angle of incidence is observed and is discussed. Several effects, including accuracy and sensitivity, of the angle of incidence in studying film growth are noted. It is shown that there exists a characteristic angle of incidence at which the growth of a film produces a negligible change in the ellipticity, and it is shown how advantage may be taken of this to facilitate measurements of rapidly changing surfaces. It is demonstrated that extraneous films are satisfactorily accounted for in measuring thin films by means of the Drude equations through their effects upon the apparent optical constants of the substrate. Advantage may be taken of this fact to extend the thickness range over which the Drude linear equations are applicable by a computational procedure. The problem of the anomalous index of refraction of very thin films as determined by the Drude equations is considered. It is concluded that the anomalies revealed by the Drude equations are associated with the system under study and are not caused by any inherent limitation in the Drude equations. It appears that at the interface between a dielectric layer and metal system there is an absorbing region which produces the anomaly in the refractive index calculated by the Drude equations and for which explicit allowance must be made in order to make accurate measurements of the thickness of very thin films. 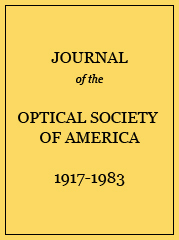 Drude optical constants on Al(oxidized) at 5461 Å.